Currently many new tech items have been hyped up far beyond their actual worth. People might have purchased quite a few new gadgets that are claimed to work sensationally with satisfying performance, but actually they didn’t serve their purposes exactly as advertised. 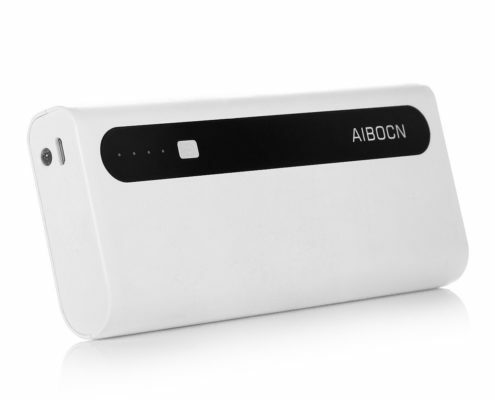 For instance, if you are looking for a 10000mAh power bank, a high capacity power bank of this type must include a reliable quality built-in battery with real specification. Because only real specification on the built-in battery cell can ensure the portable power bank’s performance in charging your phone quickly or protecting your devices with safety system. A powerful 10000mAh power bank is a safe external battery charger with highly efficient battery inside. Today we are going through the best 10000mAh power banks currently showcased on Amazon with high ranking and good reviews from customers. To get a best power bank that will support your everyday charging, let’s see the best portable 10000mAh power banks on Amazon in 2018. This 10000mAh External Battery Power Bank wouldn’t seem too appealing, instead, it has a decent, neat and low-profile design. Most importantly, it has a compact and portable size that makes it extremely easy to fit in human hands or simply pockets. This fast charging portable power bank is designed with dual USB ports, 2.1 amps and 1 amp for each. It charges two devices simultaneously with quick output. It has built-in protection that stops malfunctions, such as overcharge, overdischarge, overheating and short circuit. This is a well made product with a most affordable price: $10.99. Thanks to Anker’s exclusive PowerIQ and VoltageBoost technologies, Anker PowerCore 10000 is believed to be one of the smallest and lightest 10000mAh external batteries on the market. Customers enjoy Anker products because they are safe and powerful. 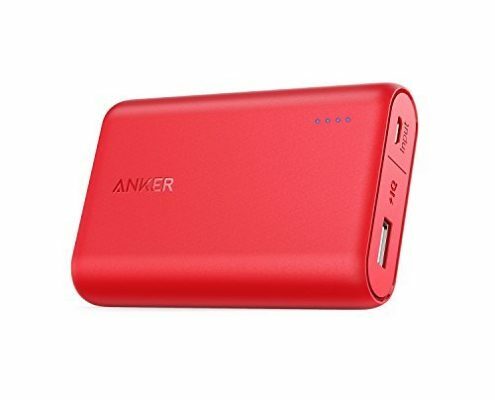 Like this Anker PowerCore 10000mAh power bank, it’s made of high quality LG battery cells with built-in safety system to ensure convenient charging. The high capacity power bank is able to charge an iPhone 8 for 3.5 times or a Samsung Galaxy S8 2.5 charges. 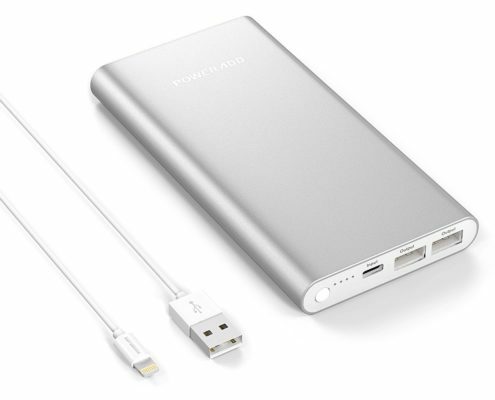 Poweradd Virgo 10000mAh battery pack is built with a powerful 10000mAh battery inside. The battery is able to hold massive battery power. When the power bank is fully charged, it’s able to offer 4 charges to iPhone 6, or a 2 and a half charges to a Samsung Galaxy s6, or at least one charge to a large-capacity device like iPad Mini. Poweradd Virgo portable power bank is constructed with high-tech grade A high-energy lithium polymer batteries which are by far more durable than ordinary ones. The advanced li-polymer battery cells and built-in micro chips can totally cure malfunctions, such as overcharge, overdischarge, overheating and short circuit. This portable power bank enjoy great star rating on Amazon. It is a powerful 10000mAh high capacity charger with real specification. 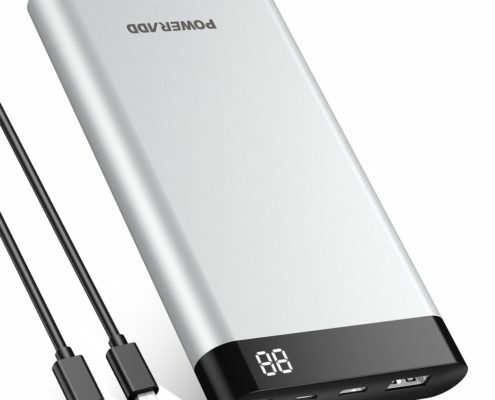 This power bank has 2 smart USB output ports, with up to 2.4A for each port. It can charge 2 devices simultaneously. This mobile charger external battery can charge your moible phone approximately 1.4 times as fast as some standard chargers. The charger has an integrated intelligent IC chip for better power management that helps charge your devices more safely. Like most power banks, it has a user-friendly LED flashlight with impressive brightness. 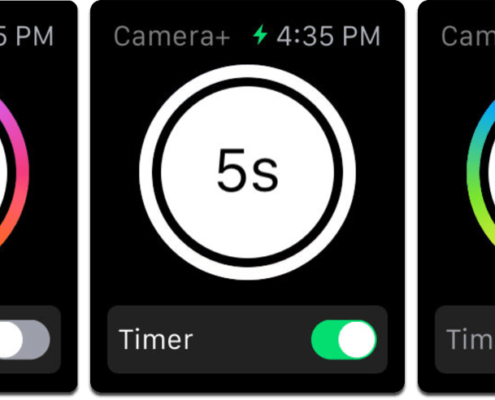 Along with the recent release of the latest Apple Watch Series 3 and updates to watchOS, there you will find a lot of new options for Apple Watch apps almost simultaneously. Install some most useful ones of these apps that you might use almost on a daily basis. Apple Watch users are more likely to use apps that are designed for workout or some other activity routine. You can see a great selection of Apple official or thrid-party apps available on the market. 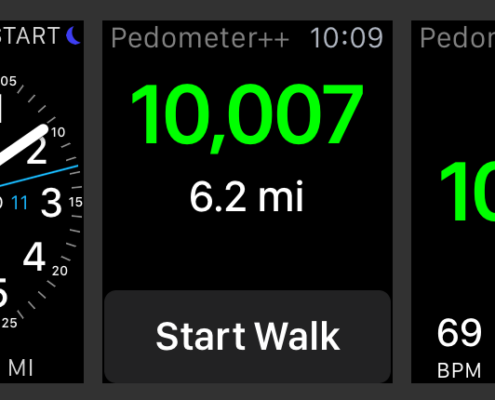 Pedometer++ is one of the best apps for everyday fitness. It focuses on the step counting and daily walking tracking. It takes advantage of the step counting capabilities in your iPhone 5s for better, easier workout. It easily tracks your daily or weekly step counts. Different from most fitness apps, this Camera Plus is camera app that gains great popularity among youngsters. This camera app for iOS system gives you more control over your photography than any other app available on the market. 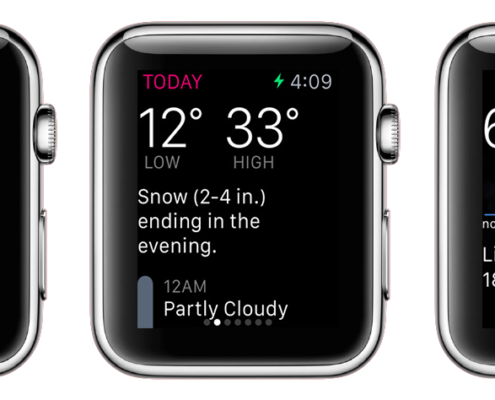 The Dark Sky app is a useful Apple Watch app for weather forecasting. It’s able to show you a notification around an hour upfront, letting you know what exactly the weather will be like for your outings. Also, you are able to check the total 24-hour timeline of weather conditions for today, tomorrow and the day after tomorrow. The Green Kitchen app serves for healthy food cook. It gives you a lot of health recipe choices. 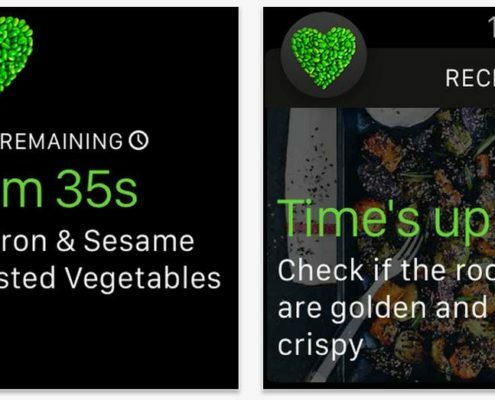 It’s a great app on your Apple Watch for you to have easy access to various organic vegetarian recipes for your health. When you need a timer for your cooking, just a simple tap will help you set the timer well. You will receive a notification through your Apple Watch when the food is ready. WorkOutDoors is a one-of-a-kind app in comparison with so many workout apps for Apple Watch. What makes it unique is that it shows people maps. 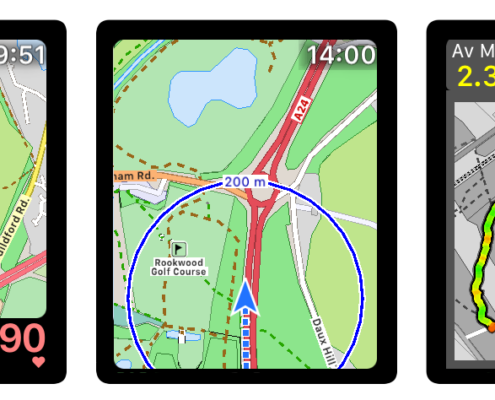 You can enjoy a vector-based map that can be easily zoomed in and out. The WorkOutDoors has more to offer, breadcrumb trails; multi-coloured speed/elevation/heart-rate trails etc. 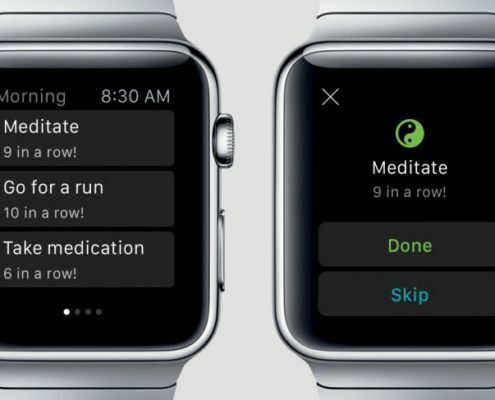 This Apple Watch app is helpful app for you to build good habits. How it works? First you set some individual habits and how often you need to act. The app is able to build some daily schedules for you to do what you are supposed to do for differnt timeline of the day. This app is especially designed for frequent cross-border travellers who often need to exchange different billnotes for different countries they are in. 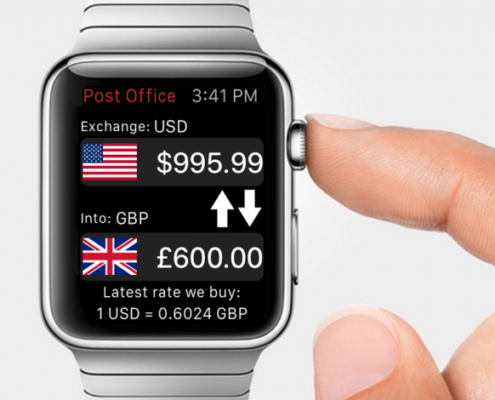 This XE Currency app syncs exchange rate data with the iPone app, making the most up-to-date rates can be read on your Apple Watch. The app also works as a handy calculator for you to convert a certain amount of money into a different currency. There are a myriad of portable power banks on the market for you to choose from. A portable power bank is able to hold a few charges for your mobile devices, like your cell phone or an iPad. It seems really helpful when you are somewhere you can’t find an electrical outlet to charge your devices with the original adapter. Suppose that you are on the way to work, on your journey outdoors, a portable power bank is your best solution to get your phone or other USB devices back to alive quickly. Nowadays, power banks are designed to be trendy in appearance design. They are built solidly with a durable casing to protect the battery inside. Manufacturers focus on the design of sizes as small sizes are more welcomed on the market. 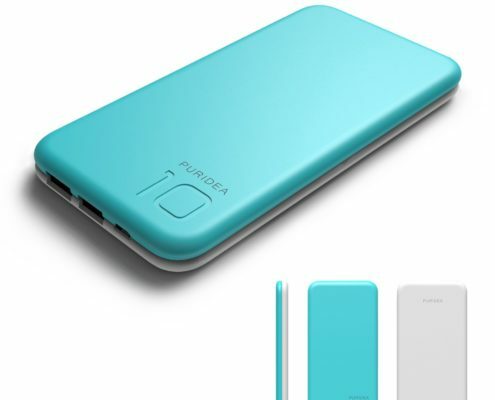 People expect a power bank to be compact, portable wherever they go. As a matter of fact, the quick charge is as important as the small sizes. The quick output USB ports charge your devices quickly and save you a lot time waiting. This is how you call it a portable useful power bank on the go, because it charges impressively fast and won’t take up too much space in the pocket or handbag when you go outside. Let’s take a closer look at the 5 best portable power banks with a lightweight design and quick USB output ports on the market. The lightweight power bank is beautifully designed to be neat and exquisite. It has a strongly built sturdy casing to make it more durable. The finely finished surface is non-slip, making it easy to hold in hand. 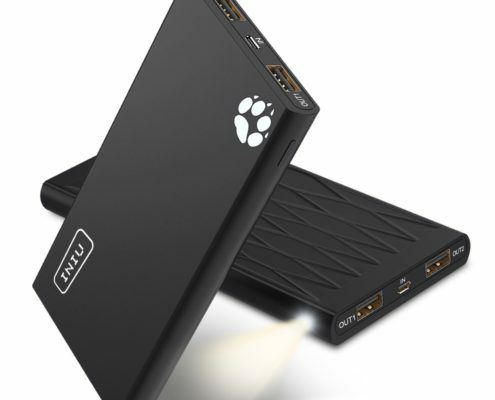 This 10000mAh power bank holds many charges for your mobile phones and other USB devices. It’s able to charge your devices at high output speed to save time for the wait. The dual USB output ports, rated at 2.1A and 1.0A, will meet the need of charging 2 devices simultaneously. This Anker power bank is designed to be very small in size, it measures only 6.6 x 2.3 x 0.9 inches. Anker’s PowerIQ and VoltageBoost allows you to enjoy the most optimal rate for USB output charging for whatever USB cable or device connected. 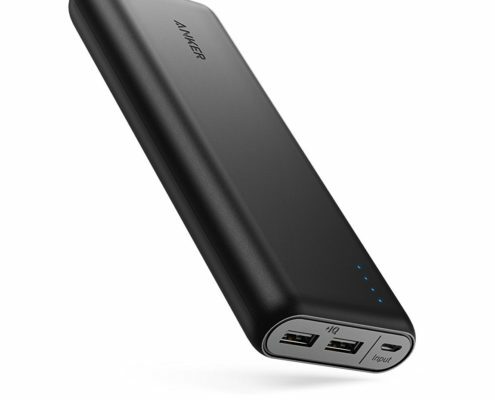 Anker 20100 power bank is significantly faster than most external battery packs on the market. 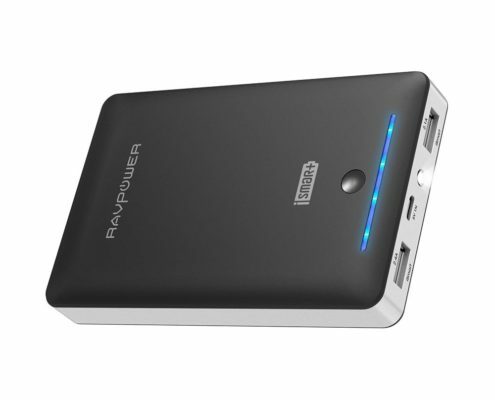 This RAVPower Deluxe Series 16750mAh portable charger features impressive product dimensions 5 x 3.1 x 0.8 inches. It’s very portable for users to take for various outings without worrying about the size or weight. The quick charging ability enables you can charge 2 smartphones or tablets at the same time with total current output up to 4.5 amps. Poweradd Pilot 4GS Apple Lightning 12000mAh Portable Power Bank has a small size of 5.43 x 2.91 X 0.54 inches, just slightly bigger than an iPhone. And it weighs in at only 9.10 ounces. The lightweight cellphone look-alike battery pack is visibly quite portable for users. It has 2 USB ports with 5V/3A for the maximum, and a 5V/2A input. The 5 V/3A(Max) ports give your device the fastest charging time for 2 devices simultaneously. This portable charger has a compact size 6 x 2.9 x 0.5 inches. Despite small size, it has a highly safe and efficient Li-polymer battery inside with 10000mAh high capacity. The portable power bank has 3.0 A for maximum USB output for your USB devices. It also has a quick input 2A to save your time charging the power bank itself.